Combine the sugar, water, and cherries in a medium pot. Bring to a boil, and then reduce the heat to a simmer. Simmer 5 minutes. Turn off heat, cover, and steep for 15 minutes. Chill. This step can be done one day ahead. Pour the wine into a glass pitcher. Strain the cherry syrup into the wine, pressing on the solids to release any cherry juice. Squeeze the juice of 1 orange and 1 lime and add to the wine. Slice the remaining fruit into rounds or wedges (for garnish), and add half to the wine along with half the fresh cherries. Add ice and mineral water, to taste. 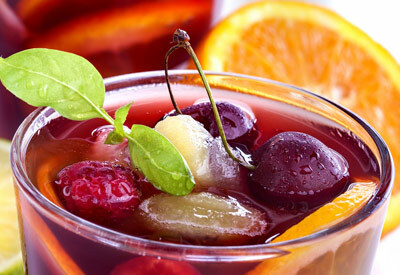 Pour the sangria over glasses of ice, top each glass with a little more mineral water if desired; garnish with sliced fruit, cherries, and mint sprigs.